The roads surrounding the Pebble Beach Concours D'Elegance are the only place in the world where you can get jaded by the sight of a mid-'60s Ferrari in a matter of days. Here's the best of what I saw this weekend. For all the upper-crust snootiness that any collection of million-dollar objects brings, the saving grace of Pebble Beach and the surrounding events is that all of these machines are expected to not just turn over, but drive on public roads during the weekend. 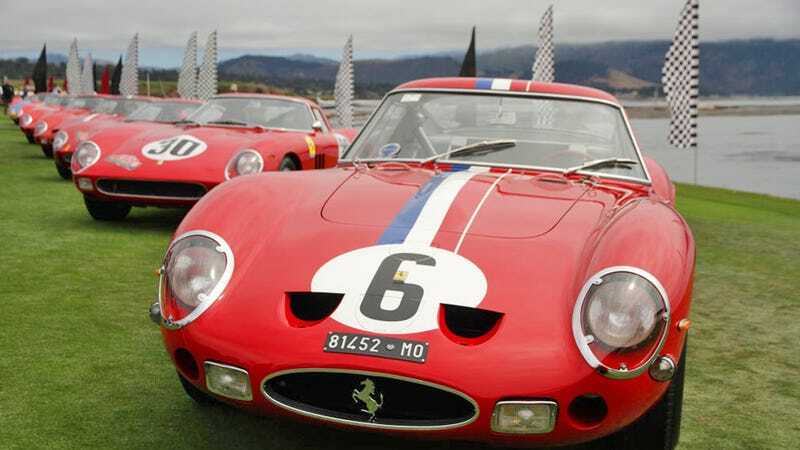 While Pebble Beach's draws included 22 Ferrari GTOs, the show at the golf course known as The Quail has grown into the weekend's other major event, a place for those who feel the Pebble Beach concours is simply too crowded with the hoi polloi. Here's a small slice of what caught my eye. If you're worried that your antique Bugatti engine isn't up to the strains of moving a few hundred yards, you're in the wrong place — and there are several Bugatti owners who enjoy not just showing their rides off, but taking them on the track at the Monterey Motorsports Reunion. Of the hundreds of cars, and dozens of vintage '60s rides, there was but one gorgeous little Iso Rivolta on the track. Owner Pete Whitehead bought it from an Australian man five years ago who had converted it for racing use. What it lacks in speed it makes up for in rarity, and of all the vehicles I saw this weekend, this was the one that made me question whether the kids can't just pay for college themselves. A custom Ford roadster with an airplane-style interior built by hot rod enthusiast Eric Zausner, this was a hit at The Quail. Eight decades before Leo Dartz envisioned wrapping cars in leather exteriors, Stutz attempted to burnish its luxury cred with something similar, covering its bodies in a leather-like material called zipon. It didn't work. While most of the cars at Pebble Beach are restored to some degree, there's also a competition for the vehicle that's still running and yet preserved in an original state, like this monster Renault. Built by a California custom body shop as an advertisement for custom Corvette bodies, this car rides on a '65 Stingray chassis, and has the original motor, suspension and other parts. Only a handful exist, none as complete as this one. Pre-WWII classic cars can seem indistinguishable from a distance, and their propensity for winning Pebble Beach's top award always made the event a bit stuffy. But the judges made a call that can only be described as punk rock in choosing this as the overall winner for 2011: a 1934 Voisin C-34 Aerodyne owned by collector and French car enthusiast Peter Mullin. Yes, it's gray, it's not a convertible and its 100-hp straight six isn't all that special. But the style and quality popped out even among the throngs Sunday.